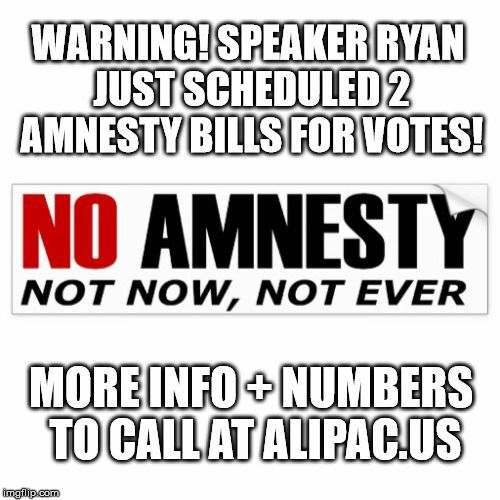 ALIPAC is scrambling to organize calls to Republicans in Washington, DC, to oppose any Amnesty bills Speaker Paul Ryan's office has announced will receive votes next week! Speaker Ryan's office announced this morning that two bills, which contain Amnesty changes in current US laws to favor DACA recipients plus more illegals up to 1.8 million, will be voted on next week. ALIPAC's new strategy to defeat the Amnesty bills, including the Trump backed Rep. Goodlatte Dream Act Bill HR 4760, is to warn GOP lawmakers that, "Any Amnesty will destroy America's borders permanently." "While Republican lawmakers are eager to couch their push for Amnesty for illegals in tough sounding enforcement legislation they claim will prevent future illegal immigration, the truth is any further Amnesty legislation will destroy America's borders permanently," declared William Gheen, President of ALIPAC. "Any legal status granted to millions of illegals will put them on the path to voting rights through legislation or resulting court actions against Congress, creating a second class form of citizenship. These millions of imported illegal immigrant foreign voters will hand permanent political power to open borders socialists who will rule America. Amnesty will allow America to have been politically overthrown and conquered by invasion." ALIPAC activists are contacting all GOP lawmaker offices with the message, "Any Amnesty bill will destroy America's borders," with special focus on President Donald Trump who is violating his most important campaign promises by supporting this "Deal on DACA" Amnesty push. ALIPAC confidently predicts that within ten years of any new Amnesty legislation passing, Democrats will have full and permanent control of all US national elections, laws, and branches of government. Any new Amnesty for illegals will also increase the number of Americans injured, raped, and killed by future illegal immigrants as well as the number of Americans displaced in communities, jobs, and elections. Any legislative promises of legal immigration reductions, chain migration limitations, non-citizenship, or added border security and walls will be made moot by the new unprecedented surge of illegal immigrants across America's borders a new Amnesty law will inspire. Amnesty legislation will signal billions of people around the world that America's native population has been subjugated, and America's border, immigration law, and Constitutional defenses have been sabotaged from within. America will be wide open and the sack of modern Rome will be unstoppable. Last edited by ALIPAC; 06-13-2018 at 12:16 PM. Please read, circulate, and utilize our press release below and DONATE NOW (HERE) to ALIPAC's funds drive so we can focus on fighting the two Amnesty bills scheduled for votes NEXT WEEK! ALIPAC Needs Thousands of Illegal Alien Amnesty Fighting Volunteers This Week!